Reliable and Valid Collection: NADP approved for MDN sites. Collection of uncontaminated samples is essential to the validity of precipitation chemistry. The MDN’s compact design minimizes splash from exterior surfaces and self induced wind turbulence. A compression seal on the underside of the cover prevents leakage of dry deposition into the container and retards sample evaporation. Thermostatically controlled heating and ventilating fan in the housing optimizes sample preservation. Heating of collection funnel minimizes snow build-up. A thermoelectric refrigeration system is available for extremely high ambient installations. Heavy duty cover drive is rated for 20 years of typical service. All parts are easy to replace without special tools. The MDN is easily mounted on a 2” NPS pipe by a socket secured with 2 set screws, The control system provides an auxiliary contact that closes during precipitation.. This contact can operate a user furnished data logger or event recorder pen in a Belfort Universal Rain gage. 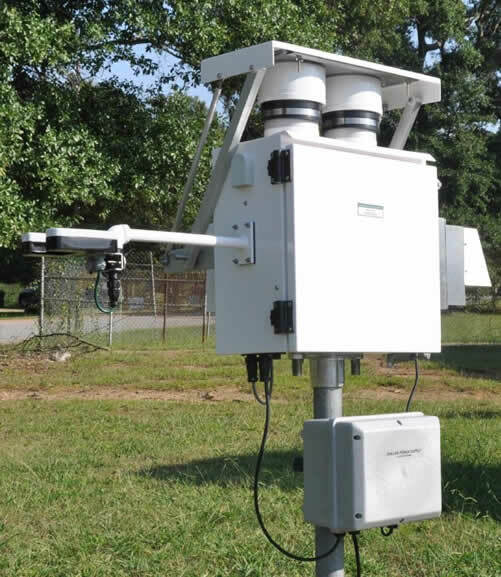 System will also interface with a variety of electronic weighing rain gauges in NADP installations.